I am writing on Saturday morning at 9:30 am. I should be out practicing my French Revolution walk, and will be soon, but I must admit that I exhausted myself yesterday to the point where today I must take good care with my health. One day Dottore Gianni will learn that he is closer to 65 than to 64, and that he must learn moderation in tourism, in spite of his enthusiasm as a tourist. Today I hope to take a step in that direction, but taking not so many steps. 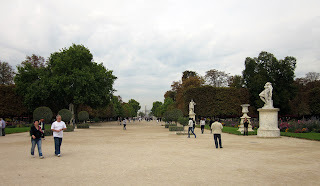 I will apprise you of today's activities in the fourth part of Le Blog de Paris, but in the third part I will detail yesterday's activities and my increasing exhaustion. Yesterday morning I felt fine, but began the day by trying to post my blog. I’m not certain what I did, but suddenly the lettering in my post turned black instead of white, and I could not fix it. Well, I DID ultimately, but it meant a late and frustrated start to my day. When I finally got out, the air was chilly and very cloudy, but I got myself to the Louvre again and sure enough the rooms I needed access to in Sully (French eighteenth century paintings) were open. 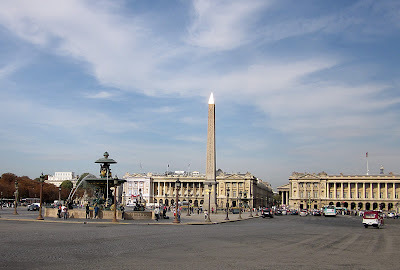 I spent a few hours there, taking notes, then walked down the Tuileries Gardens to what was once called Place Louis XV, then Place de la Revolution, and now Place de la Concorde. Between 1793, beginning with the execution of the King following through to 1794, with the execution of Robespierre and his mates this was a bloody mess. Thousands were guillotined during that time, known quite correctly as The Reign of Terror. Now it is a traffic island in one of the busiest parts of the city, but the terror now would return only when pedestrians are foolish enough to not heed the crossing signs. I walked back along Rue St Honoré, which was once the route by which carts filled with victims of the Committee of Public Safety were drawn from the Conciergerie to the Place de la Revolution, where they were guillotined. It is now a street of posh shops and restaurants, a far cry from what it was at the end of the eighteenth century. I stopped momentarily at the Comédie Française and at the Palais Royal. At the former the shop had not yet opened, at the latter there was a stoppage because of construction work. Then, remembering that I had not brought my proof of payment for the tour I was to take later that afternoon, returned to my hotel, bolted a sandwich and headed to les Invalides, where in summer of 1789 the people charged in for weapons. Finding no powder there they next headed toward the Bastille, and the rest as they say is history. This was the starting point of our French Revolution tour. Stage direction: time passes, again. It is now middle of the afternoon on Saturday, after a much less rushed walk than I had on Friday. I’m going to pick up the narrative where I left off, if you don’t mind, and why should you? Even if you do I don’t care, just letting you know my general plan. How can I put this delicately? Their French Revolution tour is not as good a tour as mine. Of course it’s not meant to be the kind of tour that mine is, as my students already have a sense of the primary events of the Revolution. But I found the places chosen, while not terrible, were not nearly as appropriate as mine are. 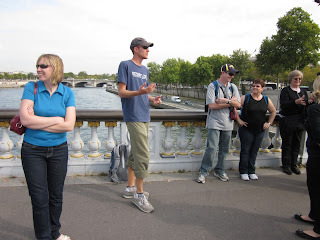 That tour was one of the main reasons for my trip to Paris. It left me, not disappointed really, but I suppose I had hoped for more. So. Travis, our guide, was better than the tour he was giving. After the Invalides he took us to the Pont Alexandre III, from which we could also seethe Grand Palais and Petit Palais, and also the Place de la Concorde. He gave us long bits of the history of the revolution at each stop, though there weren’t many of those on this tour. 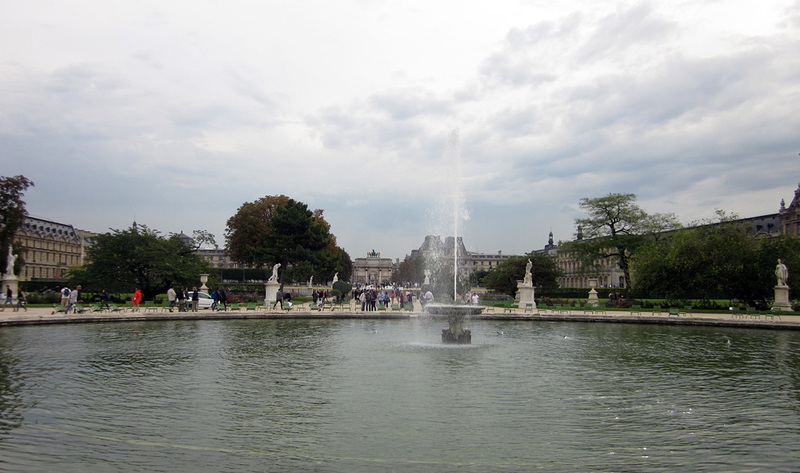 In fact there were three more only, a short stop ON the Place de la Concorde, then on the spot where the Tuileries Palace stood, until the Communards destroyed it in 1871, then another in the courtyard of the Louvre, and a final one on the Pont des Arts. Good information, skillfully told, but alas, not as useful for me as I’d hoped. 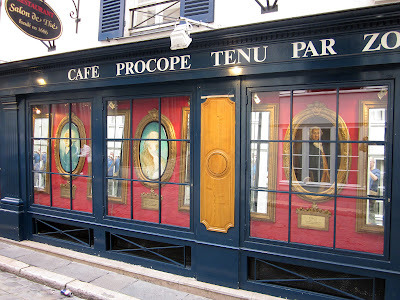 Had I gone back to the hotel just after that I would not be recovering today, but I felt the need for more, and instead of catching the Metro I plunged again into the Rive Gauche, thinking I’d sip an aperitif somewhere charming. Instead I just kept walking along, and finding things! I wandered back to Boulevard St Germain and recognized the Odeon metro stop, then to my great and good surprise also found Café Le Procope and that great little alley where Marat printed out his powerful, vicious and ironically named L’Ami du Peuple. 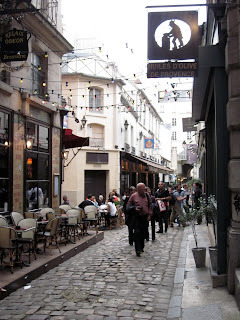 Instead of claiming victory and going home then, I’d have not been too too exhausted, but I had to push it, and plunged farther into St. Germain, which except for that main avenue itself is a bit of a tangle. Well I did get tangled, and found myself walking along mostly unknown and every once in a while known streets. 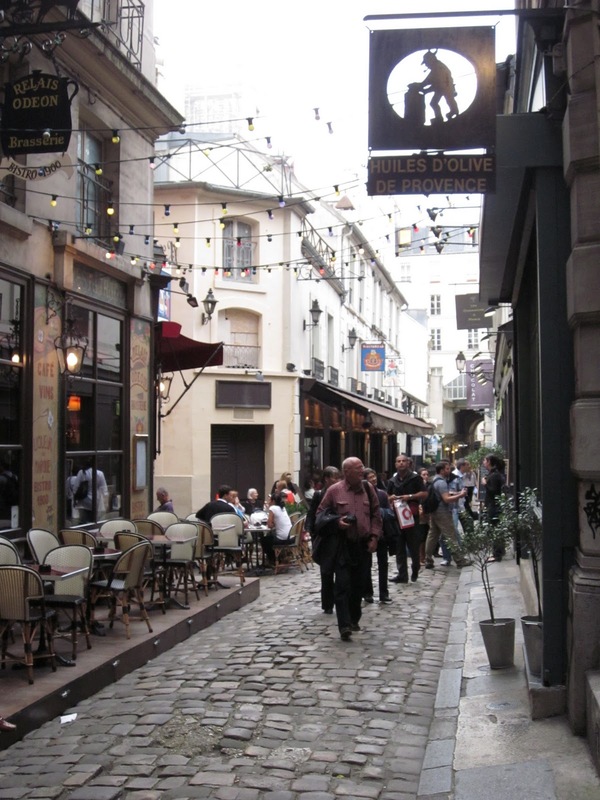 After about an hour I found myself on the Rue de Seine, which was a good sign, as I hoped it would lead to the river – it did, right back to the Pont des Arts! By then I was getting very tired. 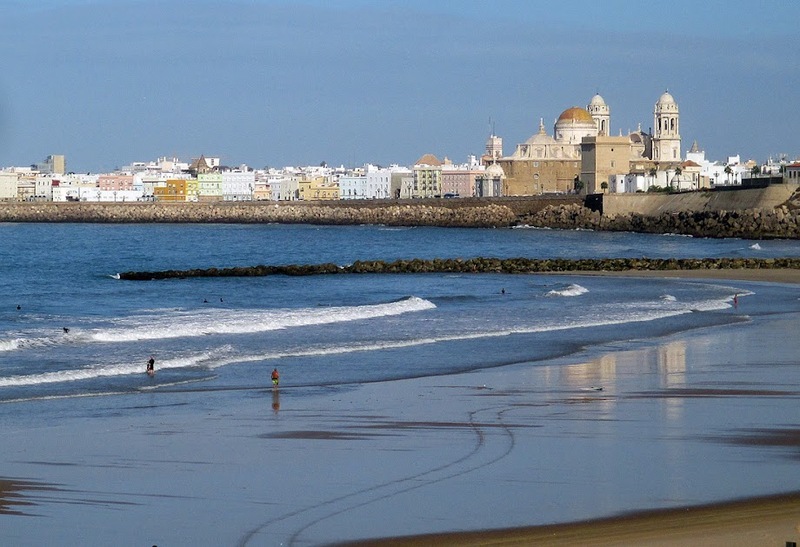 Friday had begun rather chilly and cloudy, but the sun shone in the afternoon and the temperatures were up near 80 Fahrenheit during out walking tour and on my own left bank toor after. I walked to Chatelet, from where I planned to get on Metro ligne 4 and head back to the Gare du Nord and my hotel. But then I spotted the Café Sarah Bernhardt, next to the Théâtre de Ville, a place I eat almost every time I’m in Paris. I thought I’d just get a small beer, and did. It was aperitif time still and and the waiter also placed peanuts on the table, as they do often in Europe – a little nibble to go along with your drink. Very civilized. It was quite sunny and I was seated IN the sun, but was enjoying myself and asked for a menu as well. It was windy as well and noisy, the Paris Friday rush hour in full swing, so I opted to go inside, but just inside, in the glassed in area, but still with a good view of the street. I ordered an entrecote, which was very tasty came with delicious chips and a nice green salad. Delightful! But I was also getting hotter and hotter. The waiter brought a large bottle of tap water and I slugged it down, along with the Côtes du Rhône I was drinking. I realized that I was dehydrated and exhaustion, as very possibly in heat exhaustion. I finished the very lovely dinner and finally got on the Metro. I bought more water from a nearby shop and got to my hotel room and crashed – really crashed. I took a cool shower, but was still flushed. I had also bought a pint of Kronenbourg but had no appetite for it; used it instead wrapped in a towel to nurse my hot head. I spent the rest of the evening trying to cool down and replenish my fluids. I did to a point, forced myself to remain awake until ten (but just staring into space, no writing blogs or anything that took concentration, and slept for nearly nine hours, which I am never able to do. And now that I'm quite sure I have you on the edge of your seat, I will leave you in suspense until you read the fourth and last of Le Blog de Paris!